Back in my college football days, a playbook was given to every team member on the first day of practice each season. Whether you were an offensive or defensive player, you received a playbook that defined your duties and obligations to your teammates and your school. It laid out the plays you would run and your specific responsibility on each one. You were required to bring your playbook to every meeting, and you wouldn’t dare show up without it. Using the playbooks and videos (films back then), we were able to compare what we said we were going to do with what we actually did. That’s how we got better—by learning from our losses and replicating our victories. Without a playbook to debrief against, we wouldn’t have known what worked. Basically it came down to game plans and actual execution. Based on my 35-plus years of experience in this business, I’d say the overwhelming majority of agencies and producers do not have a sales playbook. In fact, I’d estimate that fewer than 5% have one. As I’ve explained numerous times in these articles, as well as in my podcasts and presentations, the playbook describes your “set offense.” Basically we’re looking to define how you will score points (i.e., make sales) when you’re playing the game of insurance. I believe that your agency’s sales playbook should consist of three main sections: Prepare, Play, and Stay. You must prepare to play the game, you have to play the game, and then you have to stay in the game. Before I share some of the strategies behind the playbook, I want you to understand that knowing what to do is the easy part. The hard part is actually doing it. This is not about winging it and becoming semi-successful. This is about having a true culture of accountability by which you and your producers are held to higher standards of performance. Think of the word “accountability” as the ability to obtain more accounts. I love seeing how a culture of accountability changes actual performance. Service Hand-Off (SHO). It’s essential to have a strong division between sales and service responsibilities. This frees up producers to focus on their job: selling. The Producer’s Perfect Schedule. The 12% Factor is a key to being in the game and scoring points. It specifies that producers spend 20 hours a week (12% of the total week) face to face with clients, future ideal clients, and centers of influence. The goal is to have 10 sales-related appointments per week. Remember, every hole in the calendar is a lost opportunity to score points! The Non-Optionals. What are the non-optional behaviors and strategies that your producers commit to? What are the things they agree to do and be held accountable for? Unless you know the answers, you have no way to know if they’re fulfilling their commitments; every activity is something they can hide behind. Future Ideal Clients (FICs). These are neither suspects nor prospects. Accordingly, producers should have an Account-Based Marketing (ABM) strategic plan for obtaining the first appointment with true FICs. Networking Plan. These are the specific events the producer commits to attend each week, month, quarter, and year (Chamber of Com-merce gatherings, industry-specific networking events, professional seminars, etc.). The Law of Circulation is not only powerful but also is irrefutable. You have a much better chance of meeting someone if you’re out there circulating in the community than if you’re sitting in your office, aggressively waiting for the phone to ring. Center of Influence Networking (COIN) Plan. What kind of relationship management program will you have in place? The program’s centerpiece should be a schedule of proactive quarterly meetings with each of your 10 COINs. Points of Differentiation (PODs). What are the five PODs that separate you and your agency from your competition? What’s special about you? Why should people buy insurance from you? Unless you have a playbook, how do you expect to play the game other than through price-only selling? Your playbook must include a plan to hold scheduled practices and rehearsals every week. This dovetails with our belief that every opportunity deserves your very best. Finally, it’s critical to record your practice sessions. Thanks to ongoing technological advances in smartphones, tablets, GoPro cameras, and more, it’s never been easier, so there’s really no excuse not to document practices. Remember, you can’t change what you can’t see. And unless you are willing to record your performance, how can you improve? As I mentioned earlier, the vast majority of agencies and producers don’t have a playbook containing at least this core information. Although this overview doesn’t include everything you need to do to prepare, it’s a good start! Okay, prep time is up (not really, as it should be an ongoing daily activity), and now it’s time to start playing the game. That means it’s time to get out there and meet with FICs and COINs and start telling your story. Basically this is an executive briefing in which you let them know that you provide something unique in the marketplace. We stress that you should have a story that covers the three Ps: the Purpose, the Process, and the Payoff. What’s the Purpose of your unique approach? (It’s not just to try to save them money.) What’s the Process itself (other than look, copy, quote, and pray)? And, assuming you take them through the process, what’s the Payoff to the FIC? Ultimately, why they should do business with you. I’m guessing that most of you are not too sure about that. That’s why I sometimes challenge owners and sales leaders to ambush their producers at the next sales meeting and ask them about the three Ps. Listen carefully to what they say—you may be shocked. The final phase is staying in the game, which means cultivating clients for life. 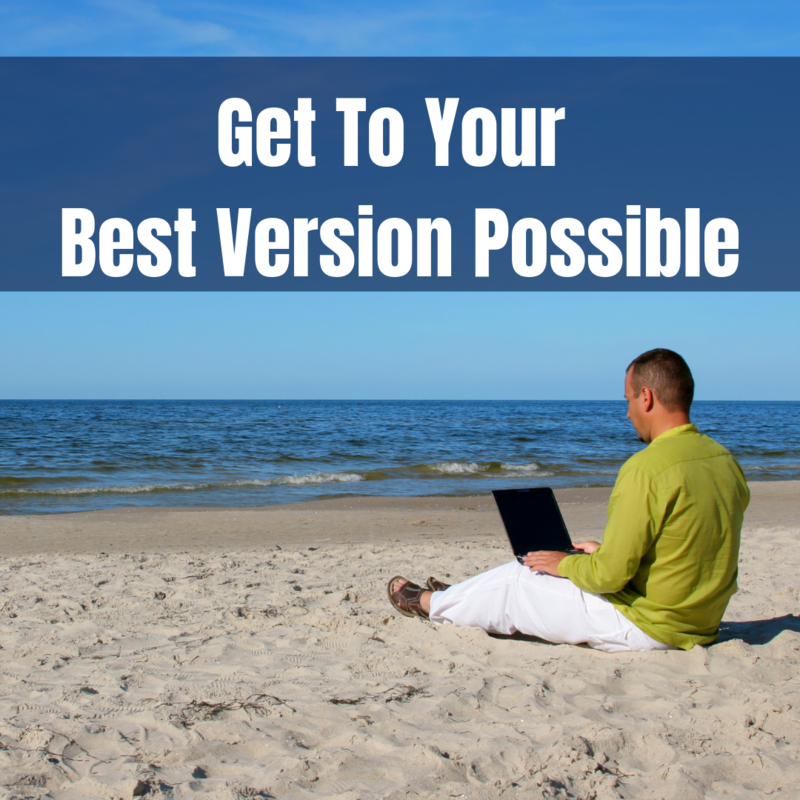 Your goal is to achieve 100% effective retention while simultaneously growing your revenue. Staying requires a continuation process and a promise-keeping/exceeding model that will drive a great client experience. 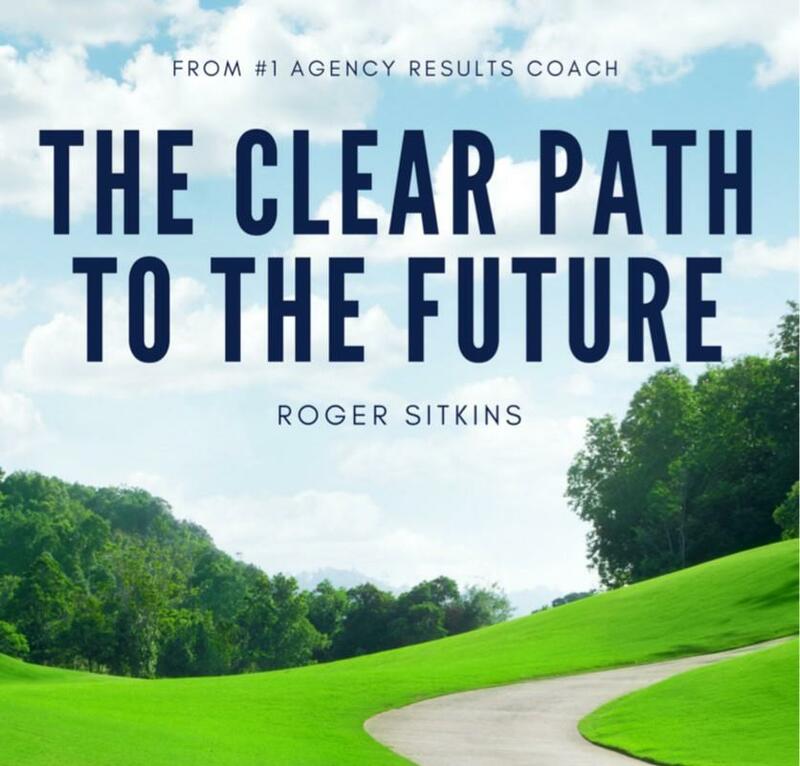 As performance coaches to the best agencies and producers, we know that without a sales playbook and a culture of accountability you’ll be winging it at best. And you’ll still do semi-okay! But at the end of your career, I can assure you that you’ll have regrets about what you would have or could have or should have done. There’s a good chance you’ve heard me talk or write about most of these behaviors and strategies in the past. If you’re one of the “I know, I know” folks who know what they should be doing but aren’t consistently following a sales playbook, you may not be on a winning team. Instead you may be like a kid playing sandlot ball, where team members huddle up just before a play and wing it. They’ve never practiced a play before they run it. Are you content to sit on the sidelines, watching the big boys play? Or do you want to be a dominant competitor who wins the game? 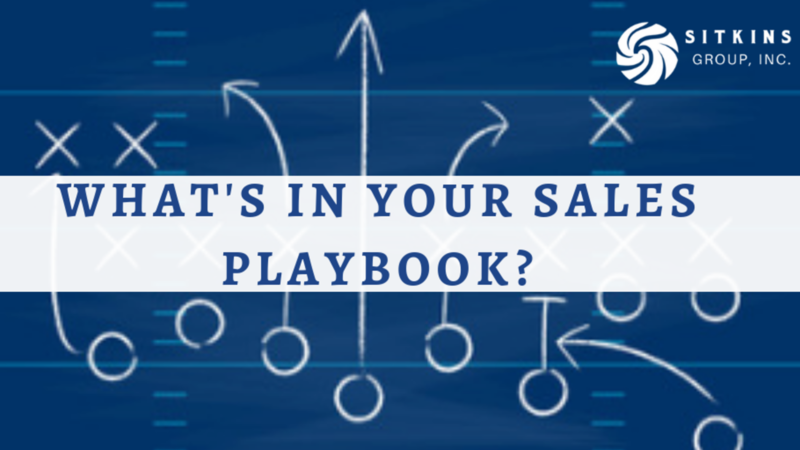 If you’re committed to selling even more, retaining even more, and earning even more, you’ll start with a sales playbook that becomes the foundation for your agency’s way of doing business. 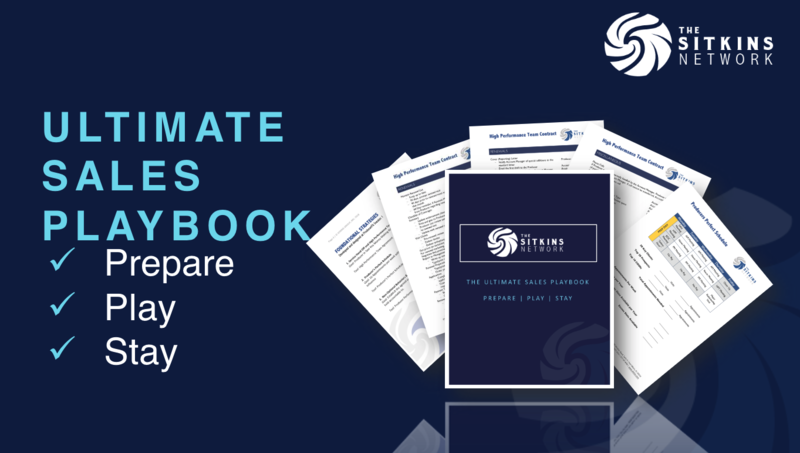 At the Sitkins Group, we provide an Ultimate Sales Playbook to the members of our Sitkins Network. 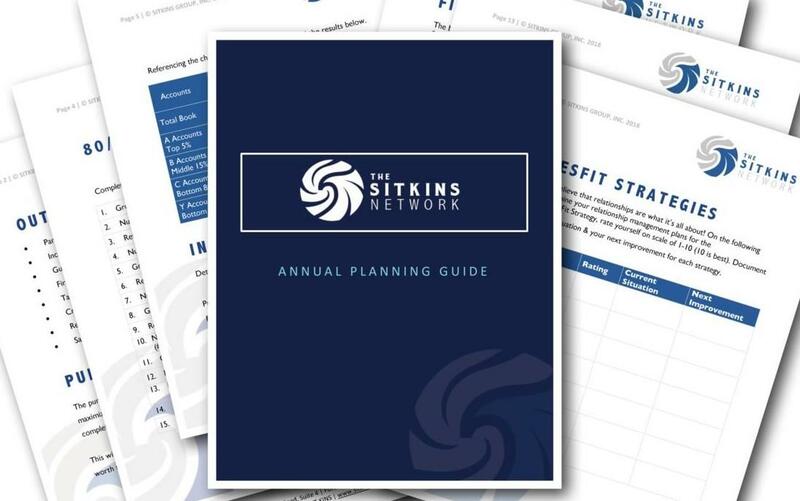 If you're interested in being one of the elite agencies with access to our Sales Playbook, or finding out how we help agencies Sell More, Retain More, and Earn More, visit our website at www.Sitkins.com.